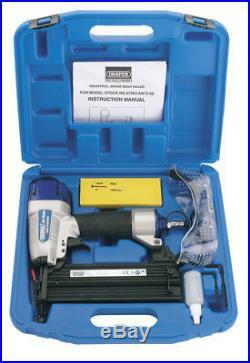 Air Nailer Kit Draper 15-50mm 57563 Brad Kit In Carry Case. For use in production environments. Suitable for nails 15-50mm long. Supplied complete in carrying case and display sleeve. 1000 x 50mm long nails. Nail size 15-50mm, Head 2mm, Gauge 18 Shank size Width 1.26mm, Thickness 1.05mm Operating air pressure 60 - 100psi Average air consumption 0.26cfm (0.75L/min) Min. Hose size 3/8" (10mm) Air inlet 1/4" BSP Weight 1.35kg. Ireland, the Channel Islands, Scottish Islands, Scottish Highlands and all-off shore UK Islands. Some domestic postcodes such as AB and international locations Cyprus, France (Corsica), Greece, Greek Islands, Italy (Zone 2), Malta, Portugal (Azores, Madeira) Spain (Canary Islands, Balearic) and Turkey may incur extra charges not listed above. If you complete and order with us and these charges are applicable to you we will contact you immediately to seek clarification on whether you wish to continue with the order. Be sure to enter the correct address as all orders are automated. APS AutoParts have been in business for over 25 years, this wealth of experience and knowledge has allowed us to source the best products and supply them at the best prices to you the customer. We are proud of our customer service and will endeavour to resolve all issues in a prompt and diligent manner to your satisfaction, if you have an issue, Please allow us the chance to fix it for you. We are proud of our customer service and will endeavor to resolve all issues in a prompt and diligent manner to your satisfaction, if you have an issue, Please allow us the chance to fix it for you. The item "Draper 15-50MM Air Nailer Kit Compressor Builder Joiner DIY Heavy Duty Nail Gun" is in sale since Wednesday, October 5, 2016. This item is in the category "Vehicle Parts & Accessories\Garage Equipment & Tools\Air Tools\Other Air Tools". The seller is "motorseamus" and is located in Newry. This item can be shipped to North, South, or Latin America, European Union member countries, Japan, Australia, New Zealand, China, Israel, Hong Kong, Norway, Indonesia, Malaysia, Singapore, South Korea, Switzerland, Taiwan, Thailand, Saudi arabia, South africa, United arab emirates, Ukraine.